This unit provides 10 Literature Linked Quick Writes, 10 Mini-Lessons, and 10 Mini-Lesson Try-It Pages for your Writer’s Workshop. 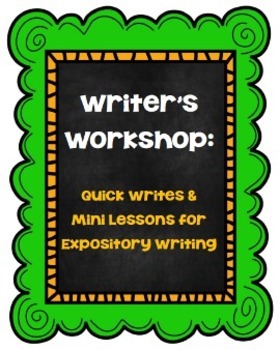 These mini-lessons are well suited for a expository writing unit. This unit provides three pages for each book for teachers to use during Writer’s Workshop. The Quick Write page gives a Quick Write topic based on the picture book. The Mini-Lesson page provides talking points to discuss the author’s craft of each skill. The Try-It page gives the students an opportunity to try out the newly acquired skill. Check out my preview to see if this unit is right for your class. Also check out my Writer’s Workshop Start-Up Kit for more information about setting up a Writer’s Workshop in your class.